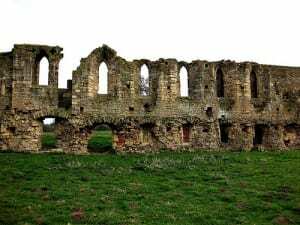 A well known story associated with the Abbey begins when Oswald’s remains arrived in Bardney. The Monks were said to have had little regard for the body and simply left it in a field under a tent. In the night, the Monks reported a huge beam of light shining down from the sky onto the remains. They believed this was a sign from above to warn them of their mistreating of the dead Kings body and took it inside the Abbey the next day. They claimed they would never shut the doors on the Abbey again, which is where the old phrase “You must have been born in Bardney” came from if someone left a door open. As you would expect from the grounds of a former Abbey, there have been several sightings of Monks roaming the area. Monks from the Abbey on Monks road would often walk to Bardney Abbey and back, and sightings of them have been reported all along the route including on Monks road. Late night walkers have reported seeing a pile of Bones near the Abbey that appeared to turn back into flesh before their own eyes. Could this be the tormented ghost of Saint Oswald? Having visited the abbey many times, day and night, I have to say I have never experienced any paranormal activity. However, the birds nesting in the ruin appear to enjoy giving passers by a scare when they decide to fly out from their nest. The abbey certainly has a spooky atmosphere with its ominous walls filled with history and character. Only one wall still remains but the gothic style windows still give a great insight into how the abbey would have looked. The only thing I have experienced in the area that I can’t explain is when I drove there one night. I had just driven past a couple of houses on the road to the Abbey and was once again surrounded by fields, when I saw a man on a bike in dark clothing up ahead. I checked my mirrors for what must have been a second, looked ahead again and he had vanished. The road was lined with thick hedges and ditches so I couldn’t understand where the cyclist had gone. I even slowed down to see if I could see the strange figure again, but saw nothing. The abbey was first known as the Benedictine abbey and was built in the 7th century. It was the first monastery to be set by the river Witham and was the home to the King of Mercia, Ethelred and his wife Osthryd. In 642, Osthryd’s Uncle, King and later Saint Oswald, was killed in battle at Maserfield. After his death, it is said that miracles occurred on the spot that he had died. In life, Oswald had provided land and property in order to help and continue the work of the Monasteries. In 675, his torso was taken to Bardney, his arms to Bamburgh and his head to Lindisfarne Abbey. His body was separated to make it more accessible for more people to be able to worship his remains. The shrine to Oswald made Bardney a very important place for Monks to pilgrimage to. In 870, over 300 Monks who resided in the Abbey were slaughtered by Vikings. It is believed that the four sons of Ragnar Lodbrok (King of Sweden and Denmark,) came to take revenge for the death of their Father. The Abbey was left in ruins and remained that way for over 200 years. In 913, the bones of Oswald were removed and taken to Glouster for safe keeping as the abbey had come under attack. The land was sold to Sir Robert Tyrwhitt who converted the building into a house. By 1718 the buildings were gone and all that remained, and still does today, is one wall of the former Gatehouse. In 1909, Vicar Reverend Charles Laing led an excavation of the site which took six years to uncover the Abbey. It was left open for 20 years for the public to see, until it was decided to refill the site to protect the remains from further damage.